With just a couple of days until the Fantastic Fifty Sale at Newark, there are a few updates to the catalogue, including full scanning results and a small number of substitute lots. Where sheep have been substituted this has been done due to scanning results or other unforeseen circumstances. These substitute lots were destined to be retained in either flock and so offer great opportunities to purchasers. The substitute list can be downloaded here and the scanning results can be accessed here. 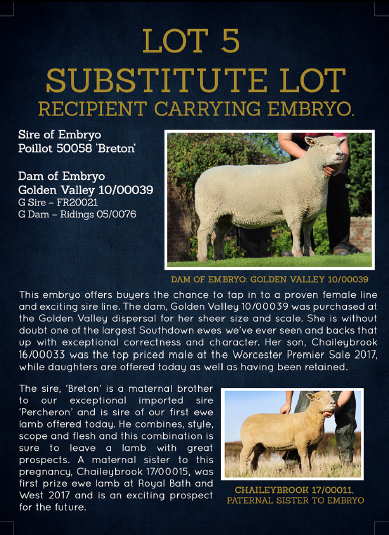 One substitute is a recipient ewe carrying an embryo, full details of which are below.